The ad campaign accentuates one of the three identifiable plots — the idea that Lopez’s Maya Vargas, after quitting a job in Queens, gets a taste of life among the Manhattan elite at a big consumer-products firm. Of course, landing that gig requires presenting a bogus resume filled with Ivy League credentials after her best friend’s son, a computer whiz, manufactures one without her knowledge. Maya is thus left trying to navigate her web of deceit — sometimes to comedic effect — while proving that “street smarts” can trump “book smarts,” and as an added degree of difficulty, overcoming skepticism toward a woman in her 40s. 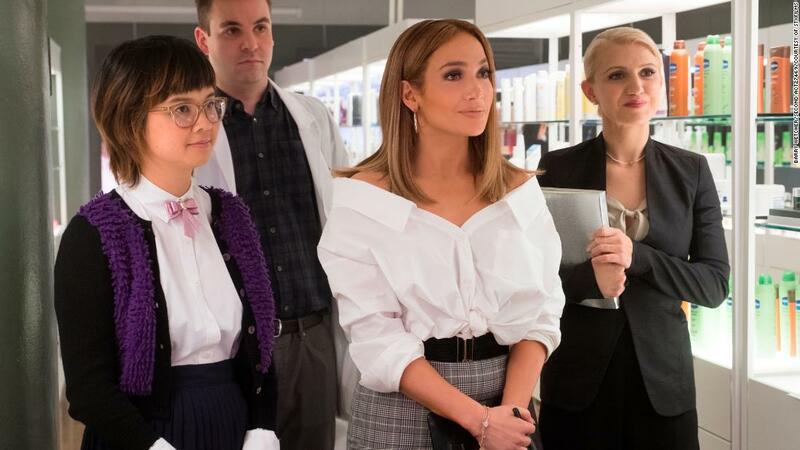 The “Working Girl” riff, however — garnished by Lopez’s earlier rom-com “Maid in Manhattan” — alternates with other key threads, including one that comes somewhat jarringly out of left field. Broadly, they involve Maya’s relationship with a younger co-worker (Vanessa Hudgens), who’s the daughter of the boss (Treat Williams), and the monkey wrench all this throws into Maya’s romance with her too-perfect boyfriend, in what amounts to a “What I did on my ‘This Is Us’ hiatus” role for Milo Ventimiglia. But as they say in late-night TV ads, wait, there’s more. Maya receives frequent help from her aforementioned pal, Joan (Leah Remini, making the hammy most of her screen time), and is surrounded by a colorful assortment of co-workers, ranging from the snobby and suspicious to the nerdy and needy. That’s a lot — indeed, too much — to juggle. Fortunately, the side characters actually produce a handful of laughs, which is helpful, since Maya sports a pained expression much of the time, dealing with both the stress of her charade and a sensitive memory from her past. Directed by Peter Segal (“Anger Management”), the movie underdevelops its most promising theme, with Maya feeling held back by “the educated people,” who look down on those who don’t share the same academic pedigree regardless of how innovative and industrious they are — qualities Maya abundantly possesses. It’s easier, rather, to show montages of her oohing and aahing at her new-found perks, like getting dragged by the wide-eyed Joan on a corporate shopping spree. The extent to which the movie works thus largely depends on how generous the audience is feeling going into it. Assuming moviegoers come with modest expectations, “Second Act” possesses enough smarts — book, street or otherwise — to surround its appealing lead with a veritable buffet of narrative options. Opening amid aspiring blockbusters, the best that can be derived from those ingredients amounts to a small, mildly tasty, pre-holiday snack. “Second Act” premieres Friday in the US. It’s rated PG-13.